(Reuters) - Tesla Motors Inc (TSLA.O) reported a wider first-quarter net loss on Wednesday, but outperformed expectations and stuck to key milestones for the year ahead, despite pressure on margins. Chief Executive Officer Elon Musk said during a conference call that demand for the company's new line of stationary energy storage systems, unveiled last week, is "off the hook." Over time, it was possible stationary storage could be a bigger business for Tesla than selling cars, he added. Tesla said in a letter to shareholders on Wednesday that "total addressable market size for Tesla Energy products is enormous and much easier to scale globally than vehicle sales." Musk said last week that the stationary battery storage systems could be “materially profitable” sometime next year. The shares of the Silicon Valley electric car maker rose about 2 percent after hours from their close of $230.43. The challenges confronting Tesla's auto business were illustrated by the company's continued cash burn and signs of pressure on profit margins. Tesla's cash reserves fell to $1.5 billion as of March 31 from $1.9 billion at the end of 2014. The company said it plans a total of $1.5 billion in capital spending this year, much of it to buy production tools for the Model X, complete its large battery “gigafactory” in Nevada, and for other facilities. Musk said Tesla's cash flow should turn positive later in the year. "It's extremely likely cash flow is really good" by the end of the fourth quarter, he said. Chief Financial Officer Deepak Ahuja said Tesla is looking at establishing asset backed lines of credit to "assure we have a strong balance sheet." Tesla reported an adjusted net loss of 36 cents a share in the latest quarter, excluding certain expenses, compared with a profit of 14 cents a share on the same basis a year ago. Analysts had expected a loss of 50 cents a share on that adjusted basis. Tesla had a net loss in the first quarter of $154.2 million, or $1.22 a share, on revenues of $939.9 million. 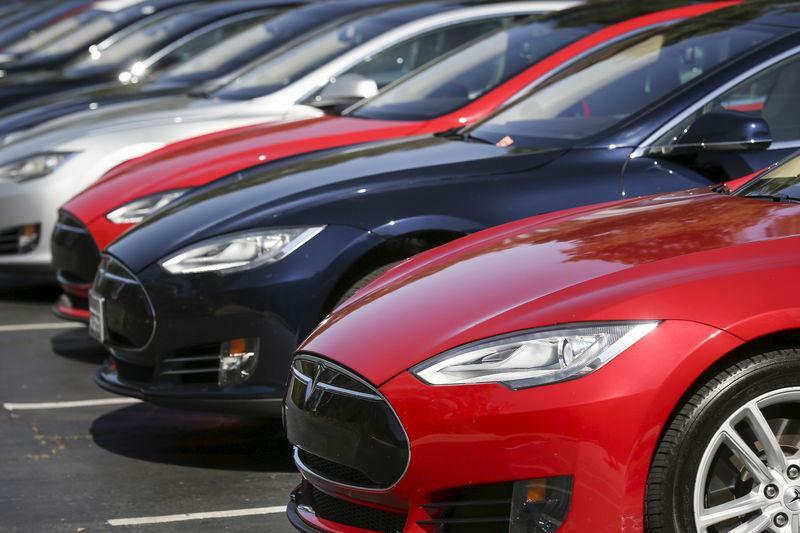 A year ago, Tesla reported a net loss of $49.8 million, on revenues of $620.5 million. However, the automaker warned that a “less rich product mix” could push down average selling prices for the Model S sedan, which now starts at $76,200. Tesla delivered 10,045 Model S sedans in the first quarter, a 55 percent increase from the year before. The company forecast deliveries of 10,000 to 11,000 vehicles in the second quarter. Tesla could face more competition in the future as established automakers field new electric vehicles with longer driving ranges. There is also the potential other well capitalized Silicon Valley companies such as Apple Inc (AAPL.O) or Google Inc (GOOGL.O) will move into the market. Tesla said it will start delivering its Model X sport utility vehicle late in the third quarter, still within the window the company promised earlier this year. The Model X is critical to Tesla's goal of delivering 55,000 vehicles this year.